Home / Sports / Chak de India ! It’s a start that everyone wanted, a win in the opening game of the tournament. West Indies were totally outplayed today. Playing in the Brabourn stadium, the Indians played top notch cricket. West Indies winning the toss and electing to field, nothing could have been more better than what unfolded later. 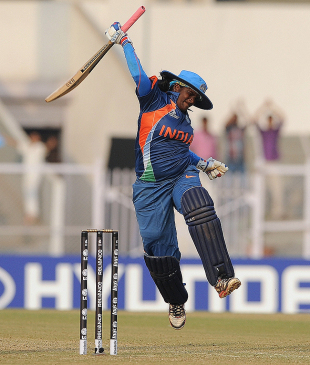 Indian batswomen Kamini was outstanding as she smashed a well deserved 100. Raut also made a good 72 and the middle order chipped in and helped India reach a winning total of 285. On the bowling front, Indians were great on field too. The West Indian openers were sent back cheaply, but the middle order did bring a scare to the Indian team but that wasn’t enough to resist India who won the match handsomely. Not to forget Niranjana, who bowled superbly and picked up 3 wickets. One thing I realized was that, there are male umpires in the game. (I know that this is happening for quite sometime now) but there should be women officials too. Also, the crowd was way too less at the stadium. Wonder if Dhoni was present in the team hut and cheer up the girls and even gather some crowd ! Well, wishing the team all the best for their encounter against the defending champions – England on Sunday. All the best Girls !! Previous Philips bids adieu to tv, music players.